A. WHAT IS DIABETES MELLITUS? Diabetes mellitus is an endocrine disorder that occurs in dogs and cats. It is characterized by high blood sugar (hyperglycemia) and it is caused by an inability of the pancreas to properly secrete enough insulin into the blood. Insulin is the hormone that controls blood sugar in the body. Insulin helps to transport glucose from the blood into the cells of the body that then use the glucose for energy. When your pet eats, the sugar from the food should be absorbed into the blood and then transported into cells for use as energy. When a lack of insulin is present, the sugar (glucose) cannot move into the cells and the glucose level in the blood becomes abnormally high. The sugar can then transform into toxic by-products. These toxins can affect nearly every organ system in the body and cause very serious and life-threatening disease. It is very important to work closely with your veterinarian to regulate your pet's diabetes as well as possible. History - Drinking a lot (cats and dogs), inappropriate urination (cats), accidents in the house (dogs). Chemistry Profile - Very marked elevation in blood sugar (glucose) levels. Some diabetic animals also have elevated liver values, high cholesterol, and lipemia. Complete Blood Count - Usually normal unless there is a secondary infection, which may elevate the white blood cell count. Urinalysis - Glucose in the urine (glucosuria). Animals that have had diabetes for any length of time may also have ketones (toxic by-products) in their urine. 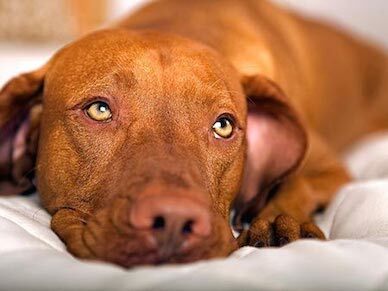 If ketones are present in your pet's urine this is a very concerning finding and your veterinarian may advise in-patient treatment for your pet until their condition is stabilized. Diabetic ketoacidosis is a life-threatening complication related to diabetes and must be treated aggressively. Treatment requires a commitment of time, money, and patience from you. There is no cure for diabetes mellitus but is can be controlled with insulin injections, special diets, and exercise management. Diabetes regulation can be frustrating during the initial months and you may feel like you are at the veterinary hospital a lot. This is normal with all animals as the initial regulation takes many small manipulations of insulin dosing to get the desired result. Once your pet is well regulated they may only need check ups two or three times a year. It is extremely important to make the adjustments to your pet's insulin in very small increments. If the insulin dose is too high your pet could experience a diabetic crisis or diabetic coma. This can be life threatening and is much less likely if insulin dosing changes are done gradually. You should never change your pet's insulin dose without speaking to your veterinarian. It is extremely important to regulate what your pet eats. Your veterinarian will dispense your pet's food to you. It is critical to the success of treatment that the feeding schedule is the same from day to day and that you do not give your pet anything except its prescription diet food unless specifically authorized by your veterinarian. A common reason for poor diabetes regulation is non-compliance with the feeding recommendations. a. Diabetic Cats - Cats will need to be on a high-protein, low-carbohydrate diet and there are several foods that will work well and are designed specifically for diabetic cats. It is EXTREMELY important that your cat eats ONLY CANNED cat food. Canned food is much lower in sugar than dry food and diabetic cats will be much easier to regulate when they are eating canned food. Current research shows that 75% of newly diagnosed diabetic cats can discontinue the use of insulin if they are fed a diet of solely canned cat food. You will likely always need to have your cat on insulin if they consume any amount of dry food. b. Diabetic Dogs - Dogs will need to consume a diet of moderately increased protein levels, decreased fat and appropriate carbohydrates. There are many diets that work well for control of diabetes in dogs. Many of these diets will also help your pet to lose weight (if needed) and increase lean muscle mass. It is important to note that many dogs that become diabetic are obese and a reduction in body fat will not only help your pet to feel better but will allow us to better control your pet's diabetes. a. Regular Insulin - This is a rapid availability, short duration insulin that is most commonly used during a ketoacidotic crisis. It can be used with other types of insulin and it is rarely used as a sole agent to control diabetes. b. NPH Insulin - This is intermediate duration insulin usually given every 12 hours. This is the most common type of insulin used in diabetic dogs. NPH insulin is obtained through a human pharmacy with a prescription from your veterinarian. NOTE - NPH insulin will begin to lose its potency after 45 days. If you have your insulin for longer than 45 days before using the entire bottle, THROW IT OUT and get a new bottle. This will increase the chances that your pet will remain a well-controlled diabetic. c. PZI Insulin - This is longer acting insulin. It is the most common type of insulin used in cats and is usually effective if used once daily. Some cats will require twice daily dosing. A bottle of PZI is more expensive than a bottle of NPH insulin, but if kept properly stored (in the refrigerator) it will keep for up to six months. Occasionally oral hypoglycemic agents can help to regulate the blood sugar in diabetic cats (they are almost never helpful in dogs). In newly diagnosed diabetic cats they can be used in conjunction with a canned food diet to control the disease. However, most people find it much easier to administer insulin daily versus oral medications. Additionally, it will take much longer to get your cat regulated with oral medication versus insulin. a. Your pet's insulin dose may need to be adjusted from time to time. The more strictly you adhere to dietary and exercise recommendations the less you will have to worry about dose modifications. b. The adjustment to your pet's insulin level may be made with the help of your veterinarian over the phone after discussing their behavior at home or after a blood sugar curve or after evaluation of the fructosamine level. However, you should NEVER make adjustments to your pet's insulin dose without consulting your veterinarian first. Overdose or under dose of insulin can lead to life threatening changes in their condition. c. There are urine dipsticks that can be purchased at the drug store. These are helpful in dogs. You can monitor the amount of sugar in the urine by holding the stick in a stream of urine. This will help to measure the glucose regulation at home. a. Keep the insulin in the refrigerator at all times!!!!!!! b. Mix the insulin GENTLY by rolling between your fingers a few times prior to drawing it into the syringe. c. NEVER shake the insulin bottle vigorously. d. Only use syringes one time. After use, put them in a sturdy container such as an aluminum coffee can and return them to the animal hospital. Do not throw syringes in the trashcan. a. Remove the needle guard from the needle. Draw back the plunger to the desired dose level. b. Insert the needle into the insulin bottle. c. Inject the air in the syringe into the bottle to prevent a vacuum from forming in the insulin bottle. d. Withdraw the plunger to the desired amount (it will usually be a very small amount). The correct dose is measured from the needle end starting at the syringe barrel, to the end of the plunger nearest the needle. a. Hold the syringe in your dominant hand. b. Pick up a fold of skin along your pets back with your free hand (pick a different spot each day) and tent up the skin. c. Push the needle through the pet's skin quickly; this should be easy and painless (for both you and your pet ). Make sure to push the needle all the way through the skin and into the underlying tissue. Try to avoid going through both sides of the skin as you may prick yourself with the needle (OUCH). d. Pull the plunger back gently to make sure you do not see any blood. It is uncommon to see blood when you pull back the plunger. If you do happen to get blood in the syringe, don't worry, it just means you are in a skin blood vessel. Remove the needle and give the injection in a different location. e. Inject the insulin under the skin by depressing the plunger. f. Withdraw the needle from the skin and dispose of the needle and syringe in an appropriate canister. a. Make sure that your pet eats prior to giving the insulin. b. If your pet does not seem interested in eating or they have vomited DO NOT give the insulin and call your veterinarian. NEVER give the insulin without seeing your pet consume their normal meal. c. Never re-dose the insulin if some leaks out while giving the injection. It is always better to have the blood sugar slightly high for one day than to ever have it too low. d. Never re-dose the insulin if you cannot remember if you gave it. It is smart to have only one person assigned to the injections. This will help to avoid the possibility that your pet may get a double dose. Also, having a calendar on the refrigerator where the insulin injection(s) is/are marked off daily will help to avoid problems. e. Monitor your pet's water intake, appetite, urination habits and weight. If there is a dramatic increase in water consumption, check to make sure that your insulin (if using NPH) is less than 45 days old. Also make sure that there has been no change in diet and confirm that your pet has been receiving the insulin injections at the appropriate time(s) each day. If all of these things are in order you will need to call your pet's veterinarian. Diabetic animals, like diabetic people, are prone to infections. Urinary tract infections are common in diabetic animals and your veterinarian may recommend a urine culture to monitor for these infections. Infections are a common reason for a well-regulated animal to have an increase in water consumption. There are other things that can cause de-regulation of your pet's condition and your veterinarian can also detect these. Occasionally insulin treatment may result in blood sugar levels that are too low. This is called a diabetic crisis and it will usually occur 2-6 hours after administration of insulin. Your pet will be especially prone to this if they have recently had strenuous exercise. Your pet may seem tired, weak, and glassy eyed. He/she may walk with a wobbly or uncoordinated gait. Should this occur, FEED YOUR PET!! This may progress to seizures or coma if not treated and is a life threatening condition. If your pet will not voluntarily eat, give 1-2 teaspoons of Karo syrup orally (or other sugar containing substances like molasses). If your pet is not able to sit and swallow, rub the karo syrup on their gums. Use caution to avoid being bit. Do not force your animal to swallow the syrup as they may choke on it if they cannot swallow. Call the hospital immediately after doing this. Call the hospital immediately if your pet is not responsive or if he/she has a seizure. If your pet is showing these signs prior to giving an insulin dose and they are eating normally, it is a sign that the insulin dose may be too high. Stop giving insulin and call your veterinarian. If your pet develops diarrhea or is vomiting, do not give the insulin and call your veterinarian. If your pet stops eating do not give the insulin and call your veterinarian. e. Walking "down in the hocks" or flat footed in the rear legs (most common in cats. 2. Fructosamine Level - This is a measure of the average blood sugar over the past 2-3 weeks. It is a very good measure of overall glycemic control. It is used routinely in dogs and is the main assessment (in combination with how they are doing clinically at home) of glycemic control in cats. 3. Blood Glucose Curve With Serial Blood Sugar Measurements - This is most commonly done in dogs and will help to determine the ideal dose of insulin. This requires a day stay at the hospital for your pet. We rarely do this in cats because the stresses of coming into the hospital will falsely increase the measurement. We most commonly just do a single blood sugar at the time of the re-check examination in cats and we routinely monitor the fructosamine level. We hope that this will help you to understand more about canine and feline diabetes mellitus. If you have other questions, we are happy to try and answer them. Feel free to call at any time if you have questions or concerns.